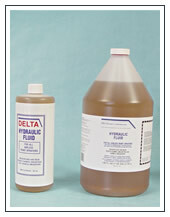 Delta First supplies a premium hydraulic oil for use in lubricating your equipment in the field. This AW (anti-wear) ISO 32 hydraulic oil contains anti-wear additives, as well as anti-foaming and anti-rust packages to keep your equipment operating in peak condition. Delta First has for years supplied hydraulic oils to OEM's in the airless sprayer industry, and will continue to offer the best oils available for your sprayers. It meets rigorous performance requirements, including Denison (HF-0 and HF-2), Cincinnati Milacron (P-68, P-69, and P-70) and Vickers (M-2950-S and 1-286-S). This oil is designed for use in high pressure pump systems, and passes a 100 hour test at 5,000 psi with no signs of wear or distress. This oil is suitable for both piston and diaphragm airless sprayers. Available in either quart bottles (12 per case), gallons (4 per case) or bulk containers (pails, drums or totes).